This week, you will learn to create and run SQL SELECT queries in the MySQL database. You will need to create a database in MySQL via Omnymbus, run a SQL script to create tables and insert data, create and execute SQL SELECT queries using the STUDENT table. Please ensure that you can connect to MySQL/Omnymbus via the account your Professor has emailed to you. Please consult with the document titled MySQLOmnymbusSupport.docx located in the Doc-Sharing folder titled Omnymbus Tutorial Files for instructions on how to get help for any issues that you are having with the MySQL/Omnymbus Environment. Submit your assignment to the Dropbox, located at the top of this page. For instructions on how to use the Dropbox, read thesestep-by-step instructions. •	Zip the files, and upload the zipped file to the Week 1: iLab Dropbox. •	Look at your email account to obtain the MySQL/Omnymbus account and password that your Professor has emailed to you. •	To help you log into MySQL Omnymbus environment, download the tutorial Login MySQL Omnymbus Environment in the Doc-Sharing folder titled “Omnymbus Tutorial Files”. •	Download the tutorial Creating a Database in MySQL Omnymbus Environment from the folder in Doc-Sharing titled Omnymbus Tutorial Files. Follow the steps to create a database in MySQL, especially paying attention to the database naming conventions specified in the tutorial. 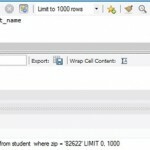 Query1	Write a SQL statement to display Student’s First and Last Name. Query2	Write a SQL statement to display the Major of students with no duplications. Do not display student names. Query4	Write a SQL statement to display the First and Last Name of students who live in the Zip code 97912 and have the major of CS. Query5	Write a SQL statement to display the First and Last Name of students who live in the Zip code 82622 or 37311. Do not use IN. 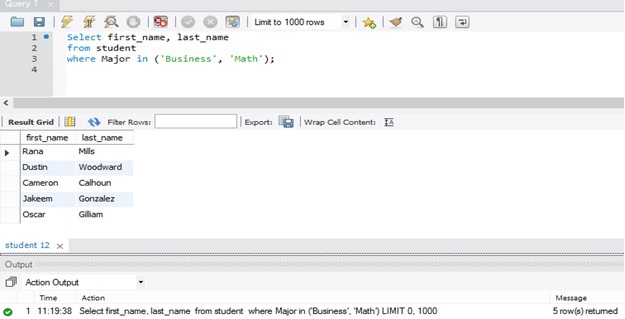 Query6	Write a SQL statement to display the First and Last Name of students who have the major of Business or Math. Use IN. 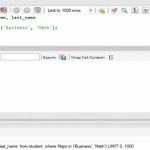 Query7	Write a SQL statement to display the First and Last Name of students who have the Class greater than 1 and less than 10. Use the SQL command BETWEEN. Query8	Write a SQL statement to display the First and Last Name of students who have a last name that starts with an S.
Query9	Write a SQL statement to display the First and Last Name of students having an a in the second position of their first names. Query10	Write a SQL expression to display each Status and the number of occurrences of each status using the Count(*) function; display the result of the Count(*) function as CountStatus. Group by Status and display the results in descending order of CountStatus. •	Download the tutorial Running SQL Scripts in MySQL Omnymbus environment from the folder in Doc-Sharing titled Omnymbus Tutorial Files. Follow those steps to help execute the WeekOneiLabScript.sql file needed to create the needed tables and to insert data into them. •	Using the data in the Student table in the database, create a SQL script file named LastName_Lab1_Query.sql, containing queries to execute each of the tasks below. •	To reference, learn and apply MySQL’s own dialect of the SQL language to this iLab, browse through the file M10C_KROE8352_13_SE_WC10C.pdf in the Doc-Sharing folder titled My SQL Documents. •	Save each query with a screen shot of the output in a MS Word document named Lastname_Lab1_Output. When you are done, zip the files Lastname_Lab1_Query.sql and Lastname_Lab1_Query_Output file and upload them to the Week 1: iLab Dropbox. -4 points: Query will not run. -3 points: Query runs but is incorrect because query required a WHERE clause to meet requirements which was not included. -2 points: Query runs but is incorrect because WHERE clause contained errors, gives popup for user input, or only meets partial requirements.